Plugin Flickr2Piwigo lets you import your albums (sets) and photos from Flickr, directly into your Piwigo gallery. Here is the procedure to follow. 2) open page [Administration > menu Plugins > sub-menu Flickr2Piwigo > tab Configuration]. We’re going to follow the steps described on this page. 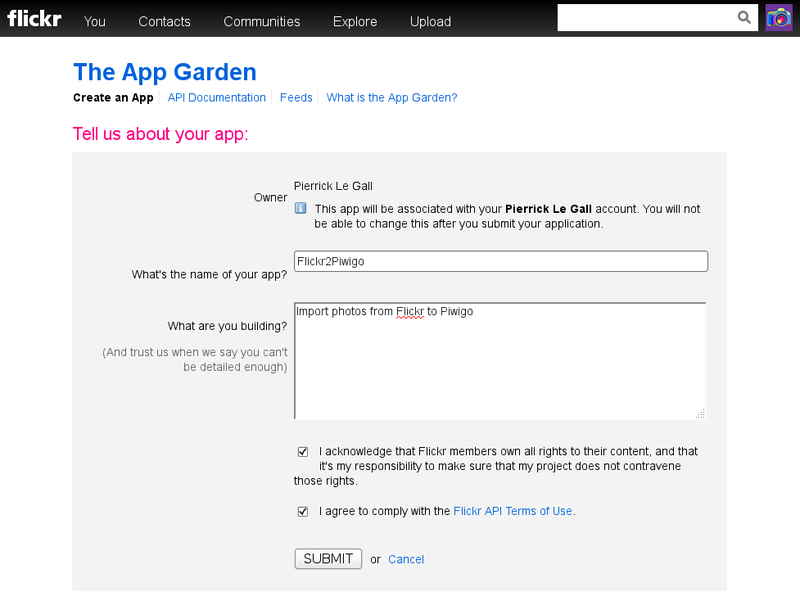 7) on the Flickr page, click on the “Edit auth flow for this app” link and copy your Callback URL, provided on Flickr2Piwigo configuration page. 9) Import your photos. 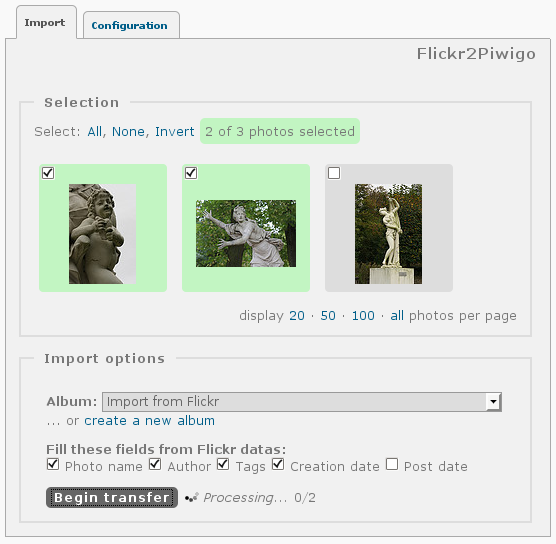 You can select photos with a specific batch manager or you can import your whole Flickr structure. I have just used this Flickr2Piwigo plugin successfully with a friend’s Flickr account. Thanks for providing this great feature. We had difficulty pasting in the Callback URL but eventually got there after starting again. 1. Make the description clearer as to when you are in Flickr and when you are in Piwigo. Thank you for this feedback Tadjio. More and more users are using Flickr Import. The suggestions are for this blog post or for the guide inside the plugin? Worked like a charm. Nice job. So so so… I am started to think that Flickr is going the wrong way and I am finally (starting) considering moving my 12K+ photos and I think Piwigo would be a great candidate to replace it 🙂 I had a question on the flickr2piwigo plugin: Does it save all the information of the pictures enterd in flickr (like geolocalization, tags etc…) ? Latitude/Longitude = yes if you have plugin “Map & Earth” or “Open Street Map” activated. * What happens to pictures that are “not” in a flickr set ? Do they get imported too ? Where can we see them ? * Sometimes an importation error occurs (luckily very seldomly: I am at 1000 photos imported for only 3 errors) and there is no way to know which picture failed being imported. We just have a message saying “ERROR An error occured” and that’s it. I agree it is better that you tell me rather than not telling anything but a little bit more information or even a direct “retry” button would be very appreciated. Apart from this, so far so good! I’ll keep you posted once it’s 100% done. Ok, import is now finished. I had to let my pc running for +1 day before it fully cimpletes. My admin session expired before the import could finish so when I came back I could not see if everything went well or not. After checking, I realized that the 12055 photos were imported (great! ), there only was a couple of errors (I’d say ~30). The only real issue I saw was that the plugin did *not* respect the privacy settings of my pictures. Thus *all* my pictures were visible to anybody by default :/ When I realized that, I just quickly passed all my albums from “public” to “private”. Good to read the import was nearly OK. I admit I have no idea how permissions work on Flickr. So I can’t tell you if it can be converted into Piwigo permissions. I’ll discuss with mistic (author of the import plugin) if he has taken permissions into account. Currently the plugin does not copy privacy parameters. 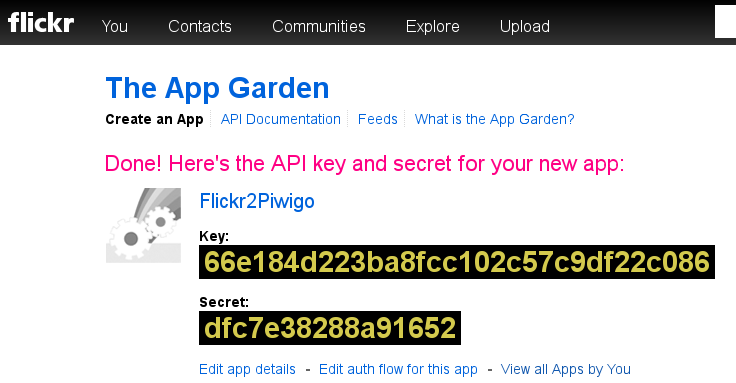 The Flickr API exposes it and it will be possible to use it. But for now the google <-> flickr authentication is down so I don’t have access to my account. When the plugin will be updated you will have to delete all your photos and start again the whole import. mistic has released a new version of the plugin, which converts the Flickr privacy settings into Piwigo privacy levels. Flickr and Piwigo don’t work exactly the same way, so the result might be slightly different. Flickr seems to manage privacy for each photo separately, the photo is either public, or private. When private it can always be viewed by the photo owner + friends and/or family. In Piwigo, we can manage permissions by groups on albums, but not on individual photos. On photos, Piwigo has a privacy level. The privacy levels are “nested”. If a photos can be viewed by “friends”, then can automatically be viewed by “family”. Piwigo privacy levels: admin > family > friends > contacts > everybody. So it’s not possible for Piwigo to reproduce the Flickr “friends but not family”. thibauld, can you give a new try? Piwigo is open source image library software. You can download it at Piwigo.org or choose the cloud based version on Piwigo.com. On this blog, we share news and best practices about Piwigo software and image gallery softwares in general. Subscribe to this blog and be notified each time a new post is published. Enter your email below to receive a notification when a new post is published.